☆ Perfect silicone Material - The fitbit charge 2 bands are made of durable and flexible elastomer. Skin-friendly and comfortable wearing experience. ☆ Buckle Design - The fitbit charge 2 wristband is designed with Stainless Steel Buckle to ensure your watch secure during strenuous exercise and a strap holder to secure the extra length. No worry about falling off your precious fitbit. ☆ Flexible & Adjustable - This fitbit charge 2 accessory wristbands can be adjusted according to your wrist circumstance. Always a mental hole for you no matter your wrist is large or small. 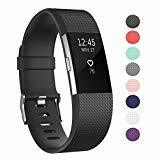 ☆ Multiple Choice - Various Colors and two selected sizes for Fitbit Charge 2 Fitness Band, this fitbit charge 2 hr bands personalize your fitness tracker to fit your mood and outfit in daily life. ☆ 24 Months Warranty: If your bands have any quality problems, please contact us, we will offer you hassle free replacement or money back during the warranty.